British MPs are to vote on the government’s EU Withdrawal Agreement on Friday, but the motion will not count as a third attempt to pass a “meaningful vote” on Theresa May’s deal because it will not cover the future relationship with Europe. 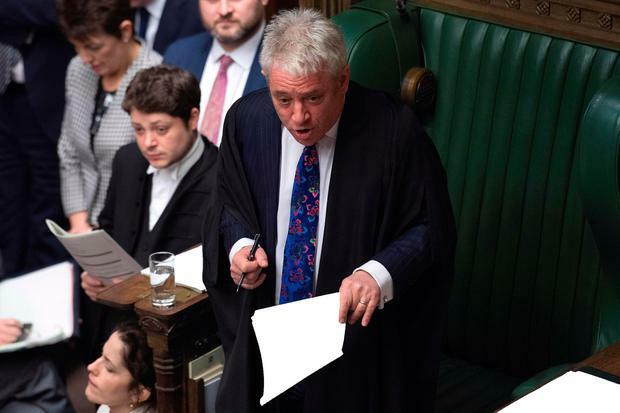 House of Commons Speaker John Bercow cleared the motion for debate, ruling that it complies with parliamentary conventions which bar ministers from asking MPs to vote repeatedly on the same proposals. If passed by MPs on Friday, the vote would qualify the UK to be granted an automatic delay to May 22 of the formal date of Brexit. But it would not allow the UK parliament to go ahead and ratify the withdrawal package, as Brexit legislation allows this only after the passage of a “meaningful vote” on both the Withdrawal Agreement and a Political Declaration on the future relationship. Moving the motion to enable the debate to take place on March 29 – which was initially slated as Brexit day – the Leader of the House of Commons Andrea Leadsom urged MPs to back the deal “so that we can leave the EU in an orderly way that gives businesses and people the certainty that they need”. Having lost control over the UK parliament and her party, Mrs May yesterday begged MPs to approve the Withdrawal Agreement in return for her resignation. But just as hope of the deal passing emerged, the DUP emphatically ruled out supporting it. 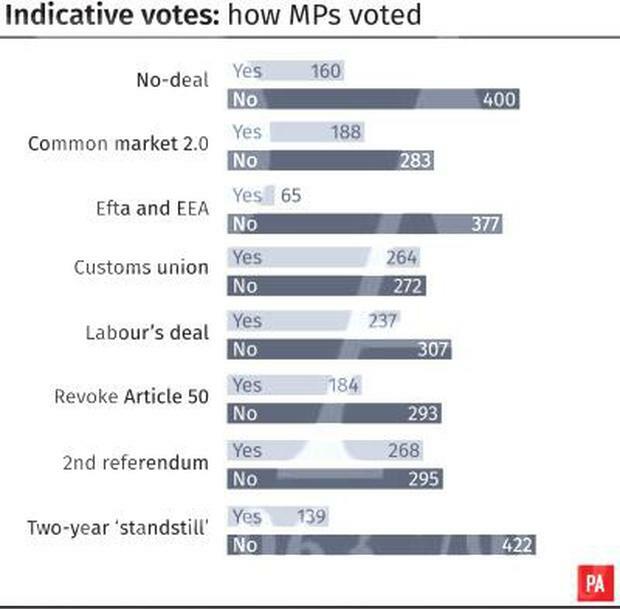 And as chaos reigned in Westminster, the House of Commons last night voted down every alternative, including a softer Brexit, no deal and a second referendum. Mrs May’s announcement was seen as “tectonic” in Dublin, where ministers were pleased by the prospect of the deal getting one last chance – but concerned the next phase of the Brexit negotiations could now be led by a hardline Brexiteer. Among those being tipped to take the keys of Downing Street is Boris Johnson. Having previously called for the backstop to be “surgically removed” from the deal, Mr Johnson will now support it. But Arlene Foster’s 10 MPs will vote against the prime minister because they fear Northern Ireland could be “trapped” inside the so-called backstop indefinitely. A statement warned it had the “potential to create an internal trade border within the United Kingdom and would cut us off from our main internal market, being Great Britain”. The DUP leader this morning outlined that the party wouldn’t be able to approve of the withdrawal deal because of the backstop provision – designed to prevent a hard border – but which the DUP say would break up the United Kingdom. Ms Foster said that the party never consider abstention on the vote as it would be the “worst of all worlds”. “I don’t enjoy delivering news like this at all but I have to stay true to what I am true to – the democratic union,” she said on RTÉ Morning Ireland. “We had to take a decision, I believe it is the only decision to take, I communicated that to her (Mrs May) and I believe that was the right thing to do. The UK government indicated it wants to hold a third vote on the Withdrawal Agreement tomorrow. However, even that is uncertain as the House of Commons Speaker John Bercow wants the proposal to be substantially changed from what was already defeated twice. There are now indications that Labour leader Jeremy Corbyn is ready to order his MPs to back a plan for any Brexit deal to be put to a “confirmatory” referendum. But the idea of second referendum received 268 votes in the parliament last night compared to 295 against. The closest any alternative proposal came to getting a majority was a motion calling for the UK to remain in a customs union with the EU. Some 264 MPs backed this, while 272 voted it down. While Mrs May’s departure will not alter the terms of the Withdrawal Agreement, it could give Conservative Eurosceptics who have opposed it a greater say in negotiating the terms of Britain’s future relationship with the EU. Brexiteer Jacob Rees-Mogg will support Mrs May’s deal if the DUP abstains. He praised her resignation announcement, saying she acted “exceptionally gracefully”. However his colleague Steve Baker said he was in a “ferocious rage” after Mrs May’s “pantomime” announcement. “I could tear this place down and bulldoze it into the river,” he said. Mr Coveney said the Irish Government’s focus “continues to be on the deal for us rather than on the personalities”. “It’s a matter for the prime minister to manage the internal politics of her own party and, of course, her own premiership,” he said. 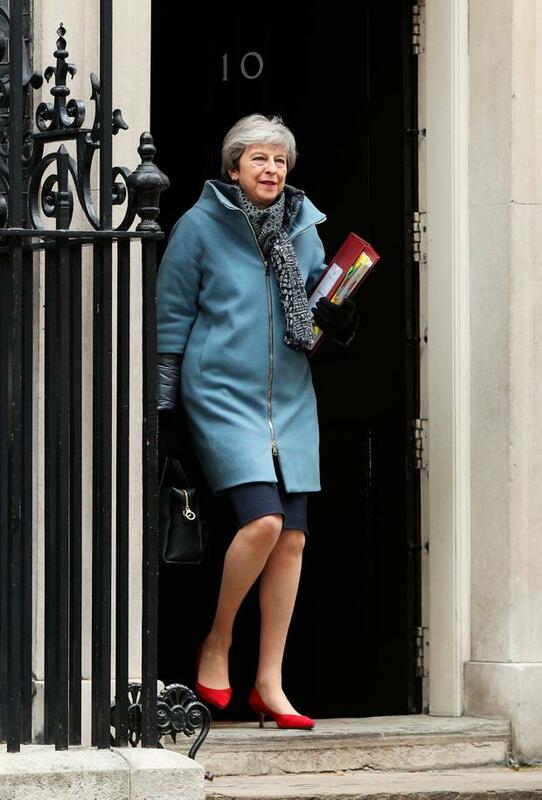 Mrs May’s office said there would be a contest to replace her after May 22 – assuming her plan gets through parliament – to provide new leadership. It is expected her successor will be in place in mid-July. Mrs May had already promised to step down before the next election, due in 2022, but by agreeing to go sooner, she increases the chances of her Brexit deal passing before the new April 12 deadline. “I am prepared to leave this job earlier than I intended in order to do what is right for our country and our party,” Mrs May said. Speaking to the European Parliament earlier in Strasbourg, EU Council President Donald Tusk told MEPs they should be “open to a long extension, if the UK wishes to rethink its strategy”. He criticised MEPs who told him that UK participation in European elections would be “harmful or inconvenient”. “Let me be clear, such thinking is unacceptable,” said Mr Tusk. “You cannot betray the six million people who signed the petition to revoke Article 50, the one million people who marched for a People’s Vote, or the increasing majority of people who want to remain in the European Union.